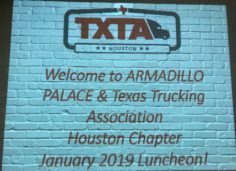 Pulido Transport attended the Texas Trucking Association Houston Chapter meeting on Wednesday, January 16, at the Armadillo Palace. Pulido Transport was represented by Alex Suescun, CFO, Charlie Maloy, Safety & Compliance Director, and Jeremy Pulido, Sales, at the luncheon. Visit www.texastrucking.com to learn more about the Texas Trucking Association. 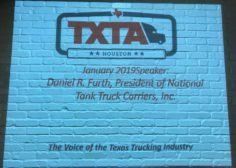 Visit www.tanktruck.org to learn more about the National Tank Truck Carriers.